Parabens: A commonly-used preservative that prevents bacterial growth in beauty and haircare products, parabens can be irritating to the scalp. Therefore, Noughty uses sodium hydroxymethylglycinate instead. Petrochemicals: Designed to smooth and soften skin and hair, petrochemicals (ex. petrolatum, mineral oils) lead to heavy buildups and limp hair. Instead, Noughty uses natural waxes and oils (ex. olive oil, shea butter) to help reduce buildup. Sulphates (SLS): A surfactant that gives shampoos and body washes their lathering action, SLS tends to be drying or even irritating to sensitive skin. Therefore, Noughty uses sodium lauroyl sarcosinate, an SLS alternative made from coconut that's much gentler on the scalp. Silicones: Used in haircare to reduce frizz and increase shine, Silicones also lead to buildups that results in lifeless hair. Instead of silicones, Noughty uses natural oils to lightly smooth and add shine. 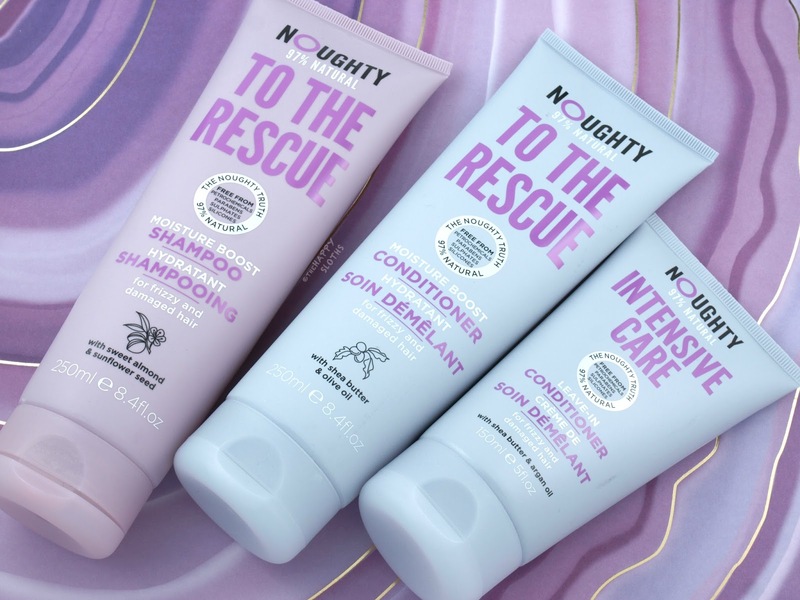 Currently, Noughty offers five different ranges designed for different hair types. 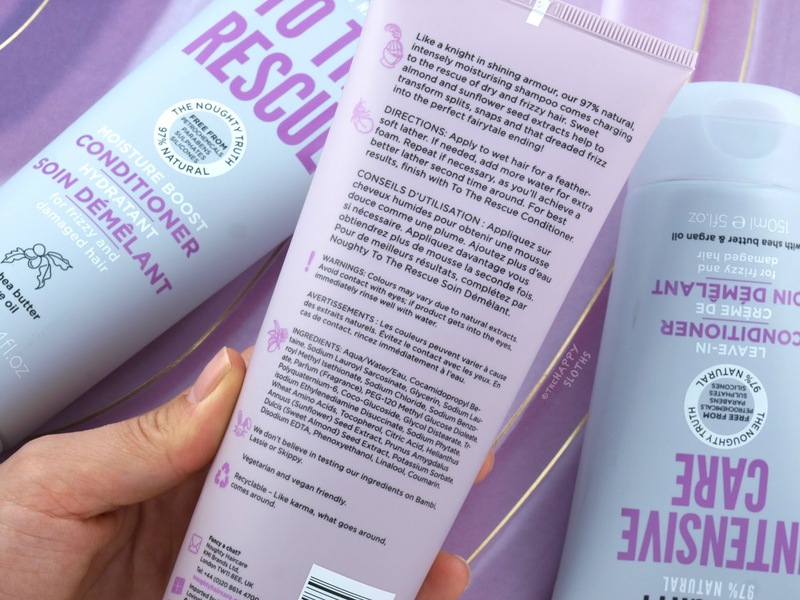 The To the Rescue Shampoo, Conditioner, and Intensive Care Leave-In Conditioner ($12.99 CAD each) are made for those with frizzy, damaged hair. Formulated with extracts of sweet almond and sunflower seed, the shampoo lathers very nicely and leaves the hair smooth and lightweight. The conditioner, on the other hand, is made with coconut oil, shea butter, and olive oil. Like the shampoo, it's very smoothing and nourishing without weighing the hair down. Lastly, the Intensive Care Leave-In Conditioner is made with argan oil, shea butter, sunflower seed extract, and sweet almond seed extract. Applied after showering, the product smoothes split ends and protects the hair from heat styling. A little goes a long way and I'm very impressed with how it makes the hair feel silky but not weighed down. Overall, Noughty is an awesome and affordable haircare brand that puts a lot of attention into its formulation. Because everything is made with nourishing oils and no silicones, the hair is left feeling smooth lightweight. I am currently giving away all three To The Rescue products shown in this post. To enter, head on over to my Instagram (see below). The giveaway is open to Canada residents only. 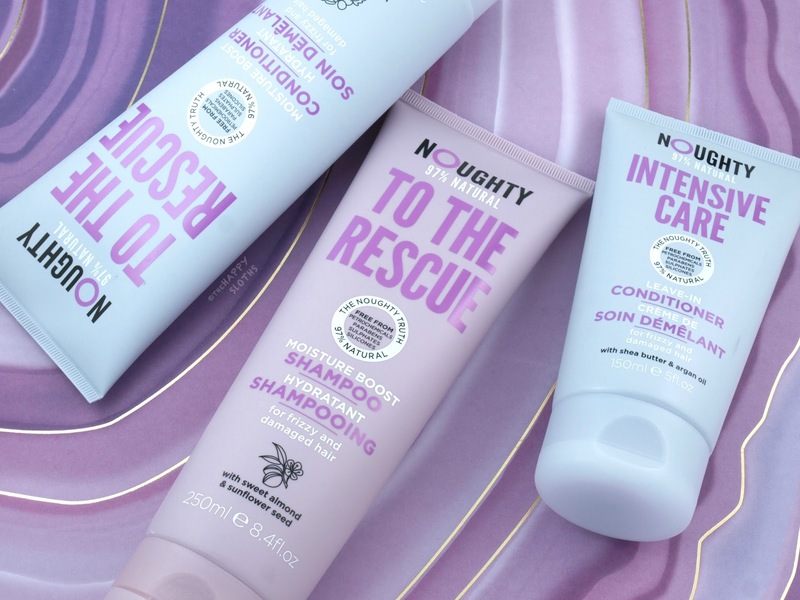 Noughty Haircare is available at London Drugs.